Fig.11 Hypothetical palaeogeography of the Middle-Late Miocene. 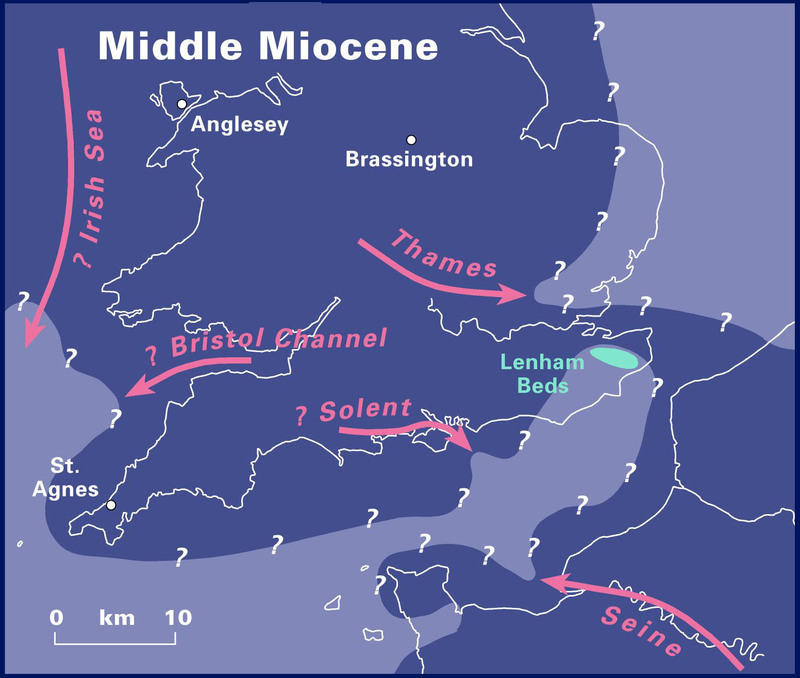 The later Oligocene to middle Miocene saw the main phases of the Alpine (Helvetic) Orogeny which was represented in the British region by inversion of the Celtic Sea, Irish Sea, Bristol Channel, Western Approaches, English Channel and Paris Basins. Subsidence continued in the North Sea, whilst Fennoscandia, Wales and Scotland were uplifted. Equally there was uplift of Exmoor in the south-west, and the Weald-Artois Anticline in the order of c.180 m in the south-east. Apart from the thin, localised aeolian and colluvial deposits of the St.Agnes Outlier, in Cornwall, Anglesey and the Brassington Formation doline infillings in Derbyshire, onland in situ Miocene deposits in Britain are virtually absent, although Chandler (1964) considered that the Bovey Formation might continue into the Miocene (Fig. 11). This contrasts forceably with the finds in neighbouring continental countries, including northern France and more particularly Germany, Poland and the Netherlands. Although there can be little doubt that rivers continued to flow in Britain throughout the Neogene, it is only in the offshore regions where unequivocal evidence occurs. The clearest example is the continued fluvial sedimentation into the Early Miocene, demonstrated in the Mochras borehole, noted above. Similarly, westerly fine-clastic input from the proto-Forth and Tyne-Tees rivers is recorded in the Central North Sea. This is joined by more substantial input from the prograding Ur-Frisia (also termed ‘Eridanos’) deltaic system from the south and south-east, first seen in late Miocene times. These deltas, derived from the Baltic River, the Rhine and the Maas, prograde progressively through the Pliocene, eventually coalescing to form a massive delta plain that occupied the southern North Sea region by the Early Pleistocene. In stark contrast to the lack of Neogene fluvial deposits in Britain stand the thick fluvial and associated sequences of the Lower Rhine Embayment in western Germany and the Netherlands, the Leipzig region of Eastern Germany and the Belchatow region of Poland. Although by no means restricted to the Neogene, these economically-important sequences include brown coals or lignites which underlie large areas and include substantial fluvial sequences of this age. Fluvial sands and gravels, together with organic-rich clay beds, indicate that meandering rivers systems, associated with extensive and long-lasting peat accumulations, dominate the Neogene accumulations. These sequences represent lowland deposition in partially coastal deltaic situations, particularly during the Mio-Pliocene of the Lower Rhine Embayment area, the rivers draining subdued topography in central Europe. The detailed palaeobotanical investigations are beyond the scope of this paper, but suggest extensive, diverse, densely- forested environments that indicate subtropical periods that alternate with temperate ones, characterised by an ‘arcto-Tertiary flora’ dominated by deciduous temperate forest. During the Pliocene the warm-temperate arcto-Tertiary flora became predominant. Indeed in eastern Germany an almost continuous sequence of floral assemblages from the Eocene through to the Pliocene is represented. Neogene fluvial sediments also occur in the Channel region. Here the early Pliocene quartz-rich Lozère Sands in the Lower Seine Valley area were deposited by a substantial proto-Seine river flowing northwestwards from the Massif Central. During eustatic sea-level low stands the Seine turned south-westwards in the Channel to enter the sea west of the Cotentin. The Solent River apparently joined the proto-Seine and thus initiated the eastern Channel fluvial system during this interval. Further south-west, the ‘Red Sands’ of Brittany are of Late Miocene to early Pleistocene age. These ‘Red Sands’ fill shallow valleys in the Armorican Massif and represent local meandering to braided stream systems. Extensive marine transgression occurred in the early and middle Miocene but deposits of this age are poorly represented in the British Isles region. Only phosphatic ‘lag’ gravels occur within the Pliocene Coralline Crag Formation in Suffolk and the late Miocene Lenham Beds that occur in solution pipes in the Chalk surface of the Weald (Fig. 3). The latter, a series of ferruginous shelly sands, are the only preserved in-situ product of the late Miocene – early Pliocene marine transgression. This transgression entered the area from the west (i.e. the Channel), not the north, the Weald-Artois anticline ridge continued to form a major barrier between the two basins throughout the period. Thus the southern North Sea remained a semi-enclosed basin that periodically inundated parts of eastern England. This late Miocene transgression has often been invoked to explain the development and superimposition of the modern drainage system in southern England. However, it is now generally accepted that any Neogene transgression was markedly less extensive in England than previously thought (Figs 11, 12). For example, Cornubia was not submerged (except the extreme south-western point where the Early Pleistocene St.Erth Beds were deposited), and therefore the inundation was of limited importance to the drainage evolution . Instead a widespread planation surface of presumed middle Miocene age (‘Reskajeage surface’) is recognised across western Britain, western Wales, Ireland and potentially northern France. Of greater significance was the substantial uplift noted above, which Jones (1980; 1999a, b) sees as resulting in substantial incision of river valley systems through the period, particularly in the Weald. However, it should be stressed that this incision is not confirmed by the sedimentary record. The absence of substantial accumulations of Neogene clastic sediments suggests that incision was not as intense as previously thought. This should be seen against a background of the lack of accommodation space, followed by intense later Pleistocene incision. Fig.12 Palaeogeography of the Late Pliocene Reuverian Stage. 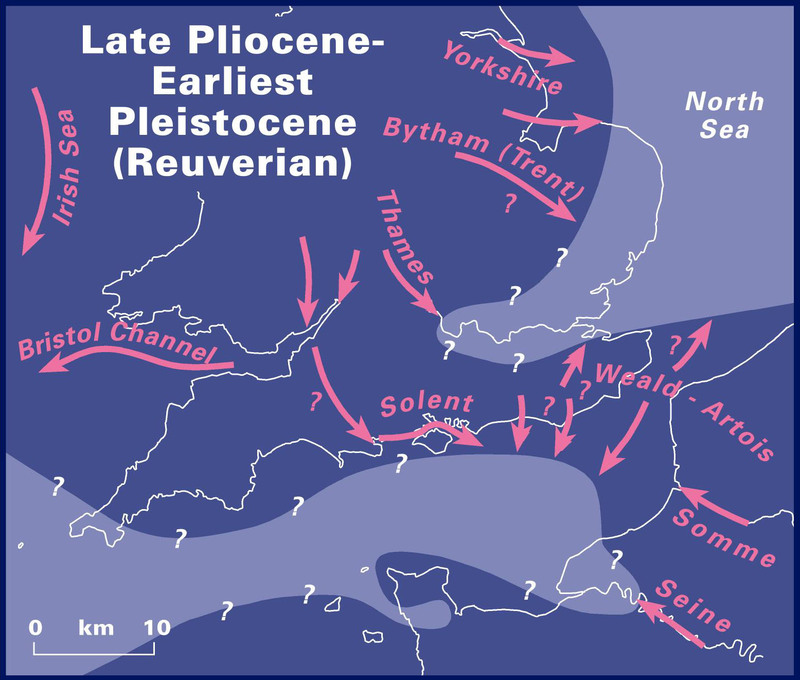 Late Pliocene to earliest Pleistocene (c. 3-2 my), fluvial sediments are very restricted in extent in Britain. At this time the London Basin was initially submerged beneath the sea (Fig. 12). Fossiliferous sands, with a lithology and fauna comparable to the Red Crag Formation of Suffolk (Fig. 3), occur at heights of up to 180 m a.s.l. on both the north and south sides of the London Basin. Subsequent early Pleistocene uplift of western and north-western Britain caused a relative displacement of c.180m between the western London Basin and the Suffolk coast . The resulting regression allowed the east and north-eastwards expansion of the River Thames system to occupy the basin vacated by the sea. Similarly, the Solent system rivers extended their courses in the Hampshire-Dieppe basin. This development is indicated by gravel and sand accumulations of the Nettlebed and Pebble Gravel Formations in the London Basin and Older Gravel Formation in the Hampshire-Dieppe Basin. Further north-east, precursors of the Trent, Humber and Tyne-Tees were present, whilst in the west rivers were re-established in the down-faulted Bristol Channel and Irish Sea basins. Similar evidence is seen in the Seine system of northern France and the Belgian rivers. The continued evolution of the river systems into and through the Pleistocene is presented in a separate section, the History of the NW European rivers (Pleistocene river history pages ). Link to Pleistocene river history pages .